In a split decision, the Ontario Court of Appeal has ruled that Canadians living abroad for more than five years do not have a right to vote in federal elections. The amendment to the Canada Elections Act allowing the disenfranchisement of expats was brought into effect in 1993 but up until 2007, Elections Canada considered the period to reset any time a citizen returned to the country. Since 2007, Elections Canada has required that citizens who have been living abroad “resume residency” in Canada in order to regain their right to vote. The Court reversed a previous Superior Court decision, rendered in May of last year, in which Justice Michael Penny threw out the voting ban noting that it creates a situation in which convicted felons retain their right to vote but stripped it from otherwise-involved citizens. Justice Penny added that expats in many cases still find themselves subject to Canadian laws and owing Canadian taxes — proving an additional, ongoing connection to the country even while abroad. The constitutional challenge was mounted by two Canadian citizens, Montreal-born Jamie Duong and Toronto-born Gillian Frank, both currently residing in the United States. They allege the law that creates the five-year rule is both arbitrary and unreasonable and cannot be saved by the federal government’s powers under Section 1 of the Canadian Charter of Rights and Freedoms. 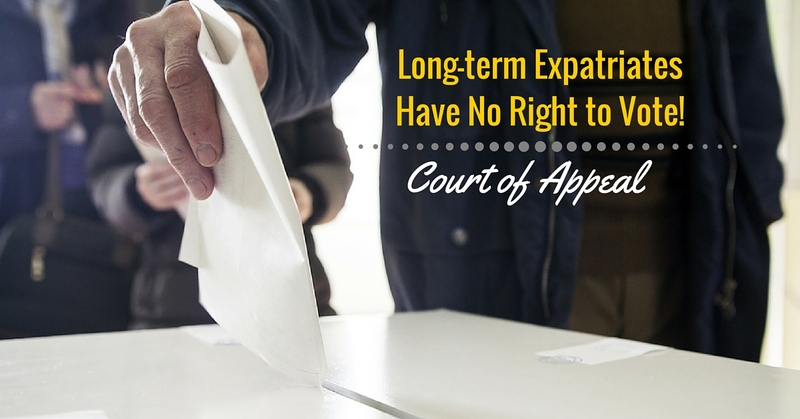 In essence, the court has ruled that allowing expats to vote undermines the legitimacy of the democratic process by putting resident-citizens at the mercy of voters who may not ever be subject to the policies or parties they support with their ballot. Justice John Laskin, writing in dissent, rejected this characterization of expatriate citizens and thereby opened the door for a possible (and probable) appeal to the Supreme Court. Laskin found Justice Penny’s judgement persuasive; found the government never argued that “preserving the social contract” justified the charter breach in its case and held it was not a good reason to limit voting rights, regardless. However unless a future SCC decision overturns this ruling, long-term expatriate Canadians continue to be disenfranchised — and with the legislation applying to more than one million citizens, that represents a not-insignificant block of potential voters left out in the cold.